Gov. Dannel P. Malloy unveiled a $40.6 billion two-year budget Wednesday that seeks $1.5 billion in labor concessions, imposes $400 million of annual pension costs on municipalities and reorganizes the financial relationship between the state, communities and hospitals. The governor also would increase taxes by close to $200 million, scaling back income tax credits for the middle class and working poor and boosting the cigarette levy by 45 cents per pack. The new budget proposal, which would spend $20.1 billion next fiscal year and $20.5 billion in 2018-19, would eliminate major projected deficits totaling $3.6 billion over the coming biennium. 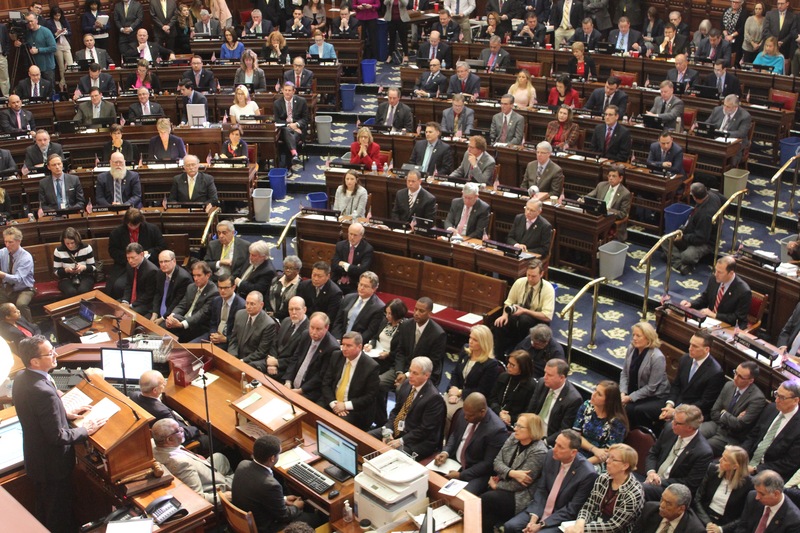 The pension fees and the hospital funding changes were designed not only to close major shortfalls in state finances, driven largely by surging retirement benefit costs, but also to shield Connecticut’s financially distressed cities. The labor savings target has an ugly alternative. According to Malloy’s budget director, Ben Barnes, the administration’s backup plan would be to seek at least 4,200 additional layoffs. The governor’s new proposal would boost overall spending in the General Fund — which covers the bulk of annual operating costs — by about 0.8 percent next fiscal year and 1.8 percent in 2018-19. Still, it would spend $1.4 billion less next fiscal year than the level necessary to maintain current services. The new budget does not recommend tolls, gasoline tax hikes or any other major revenue initiative to fund Malloy’s long-term plan to rebuild the state’s transportation infrastructure. Barnes said the governor remains determined not to have that debate until after legislators approve a constitutional “lockbox” amendment to safeguard those funds. The single-biggest spending cut in the governor’s new plan hinges on an assumption: that unionized state employees can be convinced to provide wage and benefit concessions worth $700 million next fiscal year, and $800 million in 2018-19. That is no easy figure to achieve, given that the last estimate from nonpartisan analysts involving the savings from a statewide wage freeze was less than $200 million. 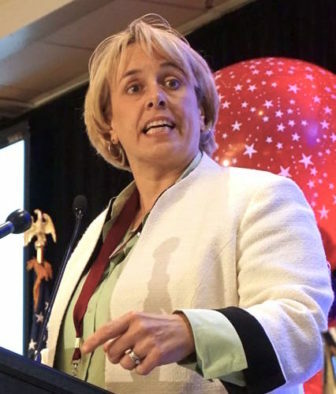 But one of the top labor officials in Connecticut, state AFL-CIO President Lori Pelletier, said Malloy’s chances of getting concessions that large, even as he boosts taxes on the poor and middle class, are slim. “I think the biggest problem is that no actual wealthy people, no millionaires, were hurt,” said Salvatore Luciano, executive director of one of the largest state employee unions, Council 4 of the American Federation of State, County and Municipal Employees. Barnes estimated that if concessions are not achieved, at least 4,200 layoffs would be needed. 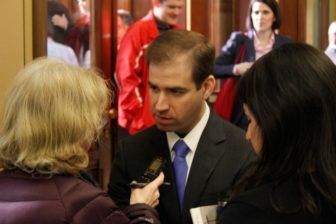 Based on savings estimates developed last spring by the legislature’s nonpartisan Office of Fiscal Analysis, it might take more than twice that number of layoffs to save $800 million per year. Regardless, Barnes said the “alternative of mass layoffs is extraordinarily difficult for us to achieve” and would be “extraordinarily hard” on both affected workers and on the public services they provide. Perhaps the biggest change in the governor’s new budget is tied to municipal aid. To help pay for spiking contributions to the state pension fund for municipal teachers – a $1 billion expense now that will grow by more than 33 percent over the next two fiscal years combined – Malloy is proposing to bill cities and towns for one-third of the cost. That would amount to $408 million next fiscal year and $421 million in 2018-19. Click image to see how your town fares. The administration notes this system would place the heaviest proportional burden on the wealthiest communities. Those districts typically pay the highest teacher salaries, giving their retirees the most generous pension benefits. At the same time, the administration also would overhaul how Connecticut finances local education, including special education services. The Education Cost Sharing grant, the state’s largest program for local school aid, would be revised to shift greater resources to poor communities. The state also would reallocate a portion of ECS grants to a new initiative to pick up a much greater share of local special education costs. The governor’s budget would maintain an existing initiative to share sales tax receipts with municipalities. 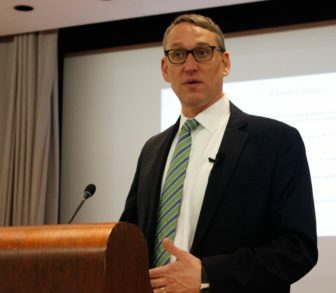 Despite that, Barnes estimated that just 31 out of Connecticut’s 169 cities and towns would see in their state aid grow next fiscal year after factoring in the new pension billing system and education funding changes. What are the chances the legislature would pass any budget that reduces aid for the overwhelming bulk of communities? “We will rise or fall together as one Connecticut,” the governor said in his budget address. 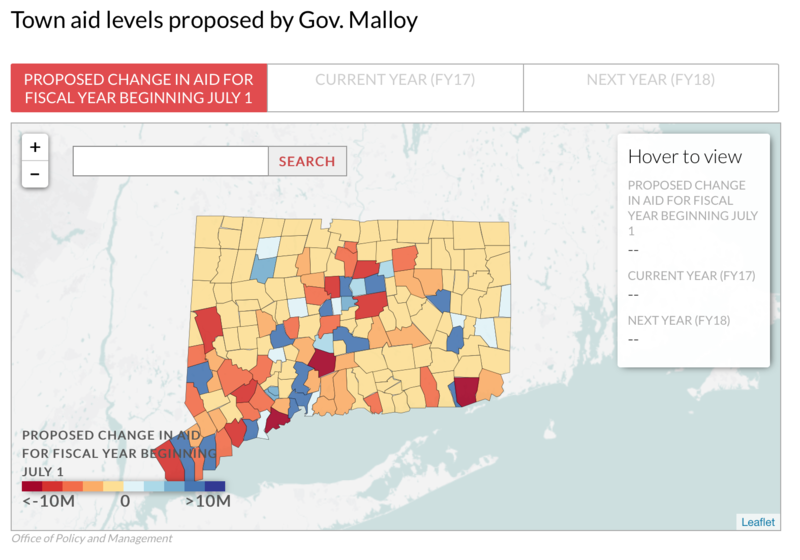 The mayors of two of Connecticut’s largest cities both gave a cautious endorsement to Malloy’s proposal to realign municipal aid. But both Luke Bronin of Hartford and Joe Ganim of Bridgeport said they still needed to analyze the plan in much greater detail. “The proposal, as I understand it, would get us a long way toward addressing those deep structural challenges,” said Bronin, who warned Malloy and legislators last year that the capital city was at risk of fiscal insolvency in the coming years without increased state assistance. Hospitals also would play a role in how Connecticut finances its cities and towns moving forward. Malloy wants to give communities the option of levying property taxes on nonprofit hospitals, which currently are exempt from this expense. The administration estimates this would result in $212 million in property tax levies on the industry. In return, the state would increase its payments to hospitals by $250 million per year. But because those payments would be eligible for federal Medicaid reimbursement, the net cost to the state would be less than $88 million per year. The state currently reimburses communities for a portion of the property tax revenues they lose because of nonprofit hospitals tax-exempt status. This payment to cities and towns would be eliminated under the Malloy plan once that exempt status is lifted. The governor’s new budget does include some investments in transportation, including 104 new positions over the next two years. Most of those jobs would support capital project planning or would help meet the growing demand for transit services. But Barnes acknowledged there is nothing to fund the major transportation initiative the governor unveiled two years ago beyond the start-up money that expires in 2020. Further complicating matters, the administration is projecting a modest deficit in this fiscal year’s Special Transportation Fund, and nonpartisan analysts say the fund will begin running in the red year after year starting in July 2018. Budget director Ben Barnes briefs the media on the governor’s proposal. Though the fund has enough reserves to cover shortfalls for a few years, Barnes conceded a long-term solution does need to be found soon. “We have not yet addressed the solvency of the Special Transportation Fund,” he said, adding that “a day of reckoning” would come in the next few years. The initial stages of the governor’s long-term transportation program, which run through 2020, largely involved planning and catching up on deferred work. Major capital projects long overdue — such as redesigning the junction of Interstate 84 and Route 8 in Waterbury and replacing the elevated section of I-84 in Hartford – remain in fiscal limbo. “We don’t have the resources to pay for the mixmaster (in Waterbury,) and we don’t have the resources to pay for the viaduct (in Hartford,)” Barnes said. “The governor has been very clear we are not interesting in pursuing additional revenues for transportation until such time as a ‘lockbox’ has been put in place,” Barnes added. Though Malloy hopes to save the most money by cutting labor costs, the budget still cuts $236 million from the level of funding needed to maintain current services next fiscal year. The new plan reduces income eligibility levels for poor families receiving health care through Medicaid, eliminates $11 million in annual assistance for small hospitals, caps dental benefits provided to poor adults, limits enrollment in a state-funded home care program and would close one prison and four units scattered in other correctional institutions. But Barnes said the new budget still preserves funding in other social services priorities such as programs to eliminate homelessness. Connecticut’s public colleges and universities, which have absorbed major cuts in most state budgets since the last recession ended seven years ago, would see their block grants reduced, on average by 4.5 percent. Towns would have to pick up the full cost of the resident state trooper program. Currently municipalities pay 85 percent of the cost for the first trooper and 100 percent for each additional trooper. The governor also proposed a $5.1 billion bond package Wednesday for the upcoming biennium that includes a new investment to renovate the XL Center in Hartford. The package includes $1.79 billion in general obligation bonding – borrowing repaid with revenues from the General Fund – and $819 million in transportation bonding, in the next fiscal year. The capital budget would be very similar in 2018-19, with $1.71 billion in general obligation bonds and $820 million in transportation borrowing. Along with transportation, the other major investment in the two-year bond package involves $1.2 billion in total over two years for municipal school construction. Another $876 million would be dedicated to capital projects at public colleges and universities. The governor proposed dedicating $125 million in bonding to enhancing the XL Center. The full cost of the project is expected to reach $250 million. Malloy and Bronin reached out earlier this month to owners of the N.Y. Islanders to invite the National Hockey League franchise to move its home from the Barclays Center in Brooklyn to the XL Center. The governor’s budget also proposed new limits on future school construction proposals. The administration’s plan would cap annual bonding requests from the governor for school construction at $450 million, and would limit the legislature to authorizing no more than $500 million annually for this purpose. The governor’s budget also proposes a new municipal accountability system designed to intervene early in cities and towns before they slip into severe fiscal trouble. Features include a new four-tier ranking for communities under budgetary stress, enhanced state evaluation of local fiscal issues, and a limit on annual property tax increases for cities and towns deemed most at risk of insolvency. Under the tier system, a municipality might be assigned to one of the first three tiers if it has a poor fund balance or credit rating, or if it relies on state aid for more than 30 percent of its revenue needs. These cities and towns would face additional reporting requirements. And those in Tiers 2 and 3 also would be barred from boosting local property tax rates by more than 3 percent per year. And appoint a manager to oversee municipal government operations. Communities would be assigned a Tier 4 ranking only if they request one from the state, or two-thirds of the new state review board deemed such a ranking necessary.